Aquatic and Theme Parks in the Canary Islands. Find out the best aquatic and theme parks in the Canary Islands for you better enjoyment during your holidays. The Canary Islands offer a wide range of entertainment offers from which you might find the theme and aquatic parks for any type of audience and ages. The best aquatic park in the Canary Islands is Siam Park, located in Costa Adeje, on the south of Tenerife. Yet in Lanzarote, Gran Canaria and Fuerteventura you’ll also find many good aquatic parks. Regarding theme parks in Tenerife it also many interesting offers as Pueblo Chico or Loro Parque. Very close, on islands as Gran Canaria you might see parks as the Palmitos Park, Sioux City or the Crocodiles Park. In Lanzarote, Fuerteventura and La Palma there are also many children interest parks. On all the island the prices are usually quite affordable. 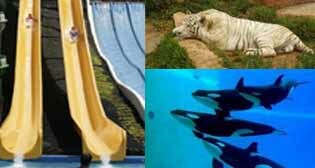 It’s important to know that there are special discounts for children, students and canary islands’ residents as well as passes to visit different parks (usually the ones belonging to the same company as Loro Parque and Siam Park). This island has an excellent offer of aquatic, theme and zoo parks. Don’t miss visiting them during your holidays! Lanzarote has many different theme parks, a refreshing and amusing aquatic park and a surprising aquarium. If you’re going to spend your holidays on this island you should visit it. In Fuerteventura you’ll find a stupendous aquatic park and a zoo park where you might see surprising animals and take a camel ride. Don’t miss visiting them. La Palma has a total of four parks. We recommend the zoo-botanical parks where you might discover animals and exotic plants. Find Them! The island of El Hierro has a stupendous lizard house that offers guided trips to observe the giant lizard terrariums.